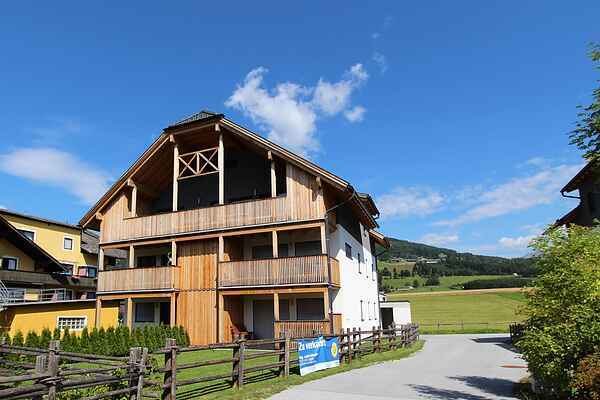 This small-scale apartment complex is located at the edge of a small villa park, near the pleasant centre of Mauterndorf. This penthouse is situated on the entire second floor. The lift stops in the penthouse! You'll enjoy the beautiful view from the large, sunny terrace. The luxurious interior with five bedrooms and two bathrooms offers enough space for up to 11 people; therefore it's very suitable for the entire family or for 2 or 3 smaller families. In the basement of the complex you'll find a ski storage and also a washing machine and dryer. Mauterndorf is situated between different ski areas such as Grosseck, Obertauern and Katschberg. The ski bus from Mauterndorf goes to all these areas. The ideal starting point for skiers who like to experience different areas. The beautiful surroundings also have a lot to offer during the summer, both for the active and less active holidaymaker. During stays from 1 June to 31 October, all guests (except school groups) receive the Lungau card for free. This is a benefits card that grants you free access to the cable cars, swimming pools, museums and much more!